Last week, I happened upon Chicago-style hot dog buns in our local Walmart. I snatched them up, along with the fixins, to surprise Jeremy this past weekend. The memory of eating at Portillo’s in Chicago, with hot dogs tucked inside those steamed poppyseed buns, accented with mustard, sweet relish, tomatoes, onions, a dill pickle spear, and sprinkled with celery salt, jolted me back in time to this past December, when Jeremy and I took a vacation to Chicago. We took a walking food tour of the city (including Chicago-style pizza, a spice shop, a chocolate shop, a sushi restaurant, a Polish bakery, a tea store, etc. – all So Fun!) We went to an interactive museum. 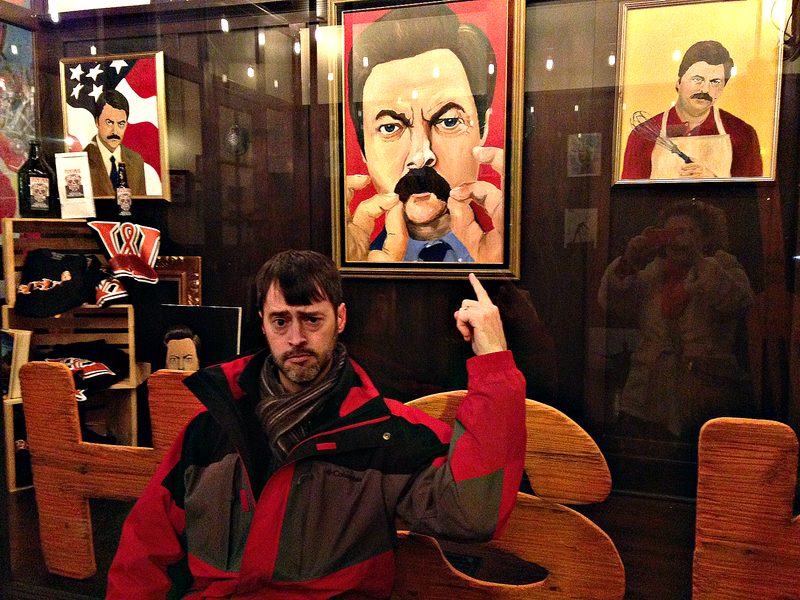 We met up with friends at a burger joint whose owners are obsessed with Ron Swanson. We found the metro station where Sandra Bullock worked in While You Were Sleeping. It was all delightfully fantastic. We loved it! We’d love to go back. But part of the reason we have such good memories of our time in Chicago has nothing to do with the fun things we discovered there. I felt something in my heart of hearts when my husband said we should buy some extra hot dogs to give to the homeless man down the street from Portillo’s. He was absolutely right; it’s always good to share. We handed the man a bag of food, along with a “God bless you.” His face said it all. He was surprised by the gesture and eagerly accepted. I choked back a few tears and squeezed Jeremy’s hand a little tighter as we walked away. The rest of the trip we looked for others in need to share our bounty with. God bless my husband’s tender heart. I love his spiritual leadership. I was also reminded, once again, that this world is so much bigger and wider than a little town in Tennessee – and just as in need of Christ’s love – when we rode the L train between huge city buildings, packed in tight with locals and tourists from all over. People-watching, with an eye toward soul-seeking, is humbling. Little you. Big city. You see that there is much work to do. We both felt the bond of Christ when we visited an African-American congregation on that Sunday and were immediately welcomed and taken care of as a brother and sister. One lady even drove us back to our hotel so we didn’t have to ride the metro all that way again. Another lady offered to meet us for lunch the next day and show us around some sites. Another family welcomed us to sit beside them. And when we left, I had a lovely feeling that we had encouraged them just as much as they had encouraged us. We want to go back to Chicago because those are Great Big Feelings we felt. They were memories of eternal significance. Too many times we Christians focus only on the FUN while we’re on vacation. After all, it’s kinda like work to find a congregation to meet with – and figure out how to travel there – and climb out of our comfort zone to meet a sea of unfamiliar faces. It’s easy to turn away from the homeless people in the big city; we’ve got to hurry and get to dinner – and then ice cream. I mean, we’re on vacation! And sometimes we can completely overlook the thousands of people in a bustling city as souls that God loves just as much as He loves us. I’ve had those kinds of vacations, too. I’m guessing we all have. But friends…we’ve missed out. There’s something even better to bring back home with us than rosy memories of the beach and family pictures in front of every landmark. We brought home memories of meeting some of our faraway church family, bound together by Christ’s sacrifice, and a stronger desire to serve those in need around us. We found true joy and saw a more abundant life in Christ with these souvenirs. 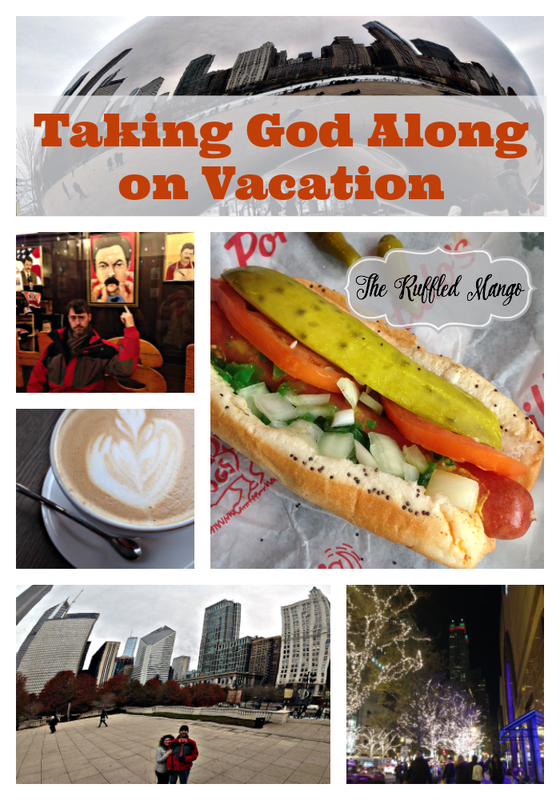 Because…as you can imagine…good, GOOD things happen when you take God along on vacation.